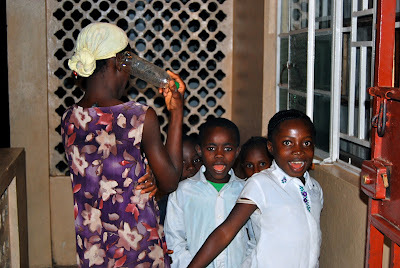 Below is written some words from James of St. Laurence House, Freetown, Sierra Leone. 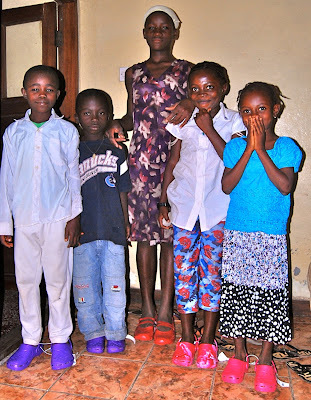 They describe his encounter with some neighbors (some of them, Muslim) who dropped by our rented house in Freetown, wishing to show their love and appreciation of Nazareth House Apostolate. They are poor, they have nothing, but they could sing and they thought that Christmas Carols would be a nice gesture. Indeed it was, a beautiful gesture, one that meant more to us at St. Laurence House than anything silver or gold or money could buy. The best gifts are from the heart. Christmas is here and Carol singing is mostly heard on one or two local radio stations, never the less few people do organize singing groups knocking at few doors if only they are welcomed to sing. Some sing and sing with the hope of getting something, but at the end of it all nothing to grab but a bite while on their way home. Surprisingly for us at St. Laurence House a handful of kids trying to imitate what the grown ups are doing sang deliciously with their humming solos taking the best part of the "long time ago in Bethlehem". We were all laughing by the strange soulful howling offerings from gentle Simba (our wild "dingo - as mama vicki calls him" dog), as he chimed in with the children. 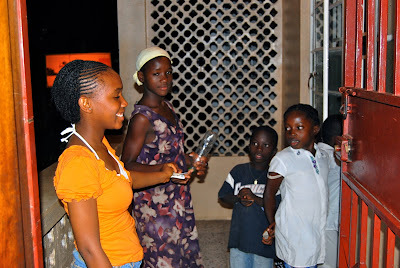 Although these children only wanted to entertain us and expected nothing, Lucy welcomed them inside St. Laurence House and slipped them a few notes of Leones (Sierra Leone currency) to help them buy a piece of candy or something for themselves for Christmas. Then she and Ann Marie looked at the children's feet and noticed some without shoes and the ones who had shoes were not in good shape. 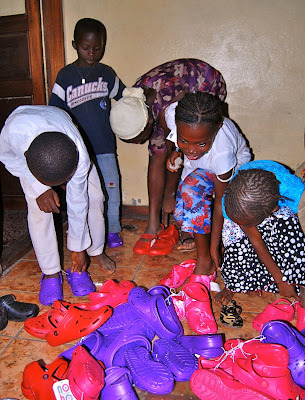 Soon the gift of small leones was quickly followed by a gift of shoes from the few we had left from the "We Got Feet" campaign. 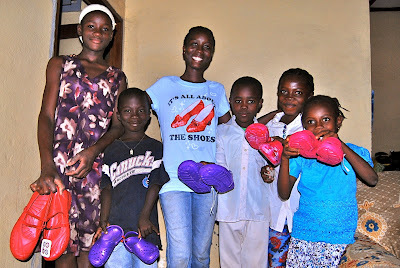 We had saved shoes for Kamasorrie Village, but thought it fitting to put shoes on these singing feet. 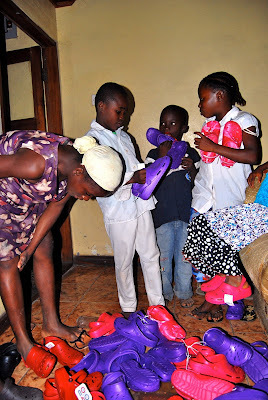 The children quickly search for shoes to fit them. and surprised to receive shoes. Notice the shirt (provided by Maria Stianchie) that Ann Marie is wearing? 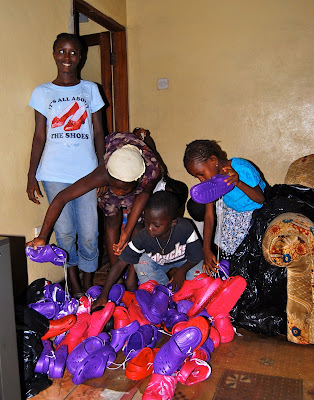 "It's all about the shoes"
one by one they find a fit. 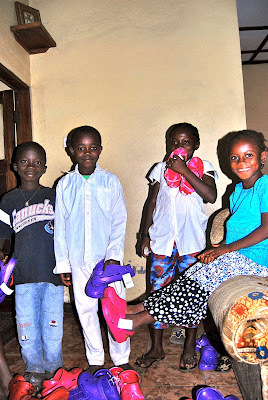 See what you are doing through Nazareth House? Bit by bit, shoe by shoe, person by person. You are making such a big difference. 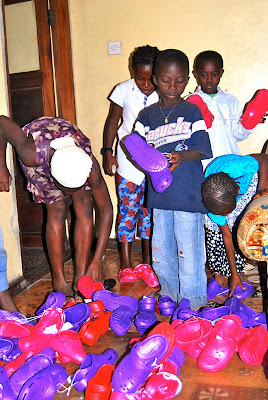 And to think that all of these feet that didn't have shoes, that now do... all this got started by a classroom of children at Penn/Kidder School in Albrightsville, Pennsylvania who asked? 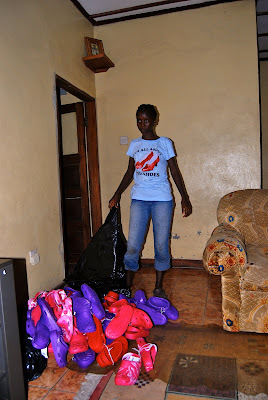 "What can we do to help the children in Sierra Leone, what do they need?". 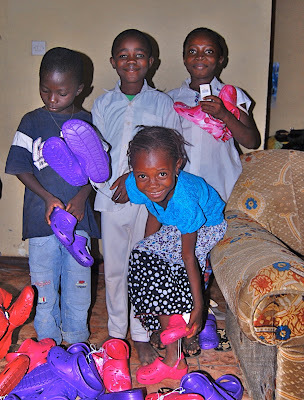 An answer came "they need shoes" and the Penn/Kidder kids through One Love teamed with Nazareth House and the story ends with shoes on many, many children's (and adult's) feet. Thank you all, what a great campaign. Now its time to move on to the next work... lets get this compound thing accomplished.... Love to you all! James.